Bella Ladies Meredith Sheer Rib Racer Back Tank Top. By itself, it's a true winner but can be worn doubled up or combined with our other tanks. 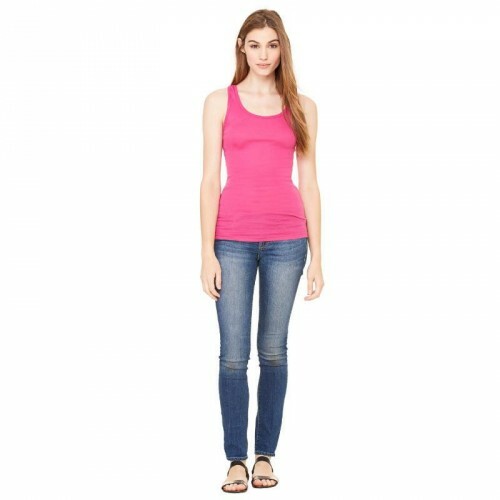 Bella racerback sheer rib tank features a longer length with a slim fitting body that is ideal for working out or hanging out. Fabric : Pre-shrunk 100% Cotton. 30 Single Combed Ringspun Super Soft 2x1 Rib Knit. Weight : 135g. Sizes : S - 8 M - 10/12 L - 14 XL - 16. Wash : Machine Wash.